8xIN, 8xOUT Dirac Live® correction DSP with Balanced & unbalanced Input & output. Boxed in sturdy 1 RU metal enclosure. 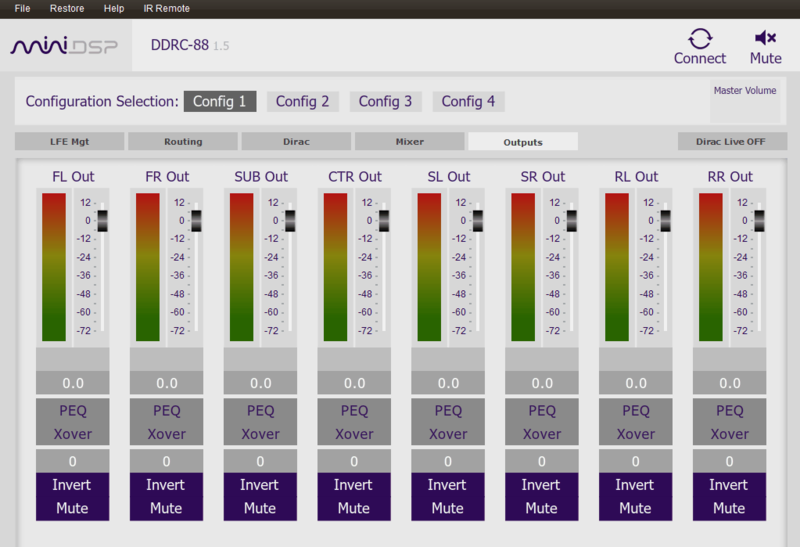 Finally, the DDRC-88A is an upgradable platform thanks to the power of the DDRC-88BM plugin. The software plug-in extends the capabilities of the DDRC-88A multichannel Dirac Live® processor. 100% compatible with all DDRC-88A units in the field, the DDRC-88BM adds comprehensive fine-grained bass management and crossover capabilities. The input signals are low-pass filtered and summed to generate the subwoofer signal; a matrix mixer routes or mixes these channels for the Dirac Live® algorithm, which in turn has its outputs routed or mixed to the output channels, where additional high/low pass and parametric filtering takes place. In addition to improved bass management for conventional home theater signal paths, the DDRC-88BM allows innovative solutions like multi-subwoofer control and combined DRC/active loudspeaker setups. NOTE: The Dirac Live Calibration Tools for miniDSP software is only compatible with the provided UMIK-1 microphone for measurement. In this app note we will show you how to perform bass management with the miniDSP DDRC-88BM plugin and optimize it for your system. Check out this complete step by step application note on how to use the DDRC-88BM to build an active speaker setup fully corrected by Dirac Live. In this app note, we describe how the very powerful "Multi-SUB" optimizer to tune multisub on a 5.3 setup. A great app note showing the combined power of Dirac live, MultiSUB optimizer on miniDSP platforms.